Think I need a prettier pot! Time has come to pack Christmas way. Saturday 5 January saw Twelfth night upon us and as tradition dictates it is the final day of the Twelve days of Christmas. As such all Christmas decorations should be removed and packed safely away until December. Decorations where slightly simpler this Christmas, I did not get the opportunity to make my own table decoration using holly from the garden, so settled for a few baubles on a plate. The tree had a simple theme, some lovely natural themed Christmas decorations thanks to Wilkinson. For the second year running the Christmas tree was a real tree, looking rather lovely in the lounge, I was lucky to win the tree from Love Plants. However next Christmas it will be an artificial tree a whooping 6 foot tall, a bargain 50% price reduction to just under £100 from my local Wyevale store. There is but one item that remains on display, which did not quite show it's full potential and is only just bursting into colour. 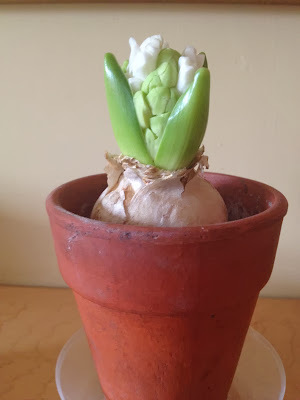 The Hyacinth bulb, has after a slow start begun flowering, which I confess makes me feel Spring is not too far away.